THE FIRST STORM of the hurricane season has left in its wake subtropical deadfall, a clear blue sky and blazing sunshine – perfect weather for the biannual Bermuda Ball Hockey Association tournament at the Admiralty House recreation area on the island’s north shore. As Hurricane Karen makes its way across the Atlantic toward Nova Scotia, members of the six teams – mostly expats, half CAs – are warming for a crack at the prized Robin Hood Cup (named for a favourite watering hole). Anyone not on the outdoor cement surface is sitting on coolers at the grassy sidelines drinking Heinekens or Gatorades, ready to cheer on their favourite team. Music blares from portable stereos as the audience soaks up the action and the glittering aquamarine seascape. The island, 920 kilometres off the coast of North Carolina, is experiencing rapid growth as a financial services centre. It is not unusual for the career sections of the newspapers to have four or five pages of ads for professionals. Given Bermuda’s low unemployment rate and population of 63,000 (one of the best-educated populaces to boot), companies often have to look elsewhere to find qualified professionals to fill employment needs. As a result, of the 700 chartered accountants on the island, 200 are Bermudian and the others are either Canadian or British, split more or less evenly (there are a few CPAs). Canadian CAs are prime recruits because Bermuda follows Canadian accounting rules and the Institute of Chartered Accountants of Bermuda (ICAB) has been a part of the CICA since 1973. Proximity to North America and the fact that it is a self-governing British colony are two reasons why it joined the CICA, says Alan Bissell, executive director of the ICAB. Another reason CAs are easier to recruit than CPAs could be that under Canada’s tax system, citizens who can prove non– residency for two years do not have to pay income tax. About half the CAs who come to Bermuda are hired in industry, most often in financial services areas such as mutual funds and insurance. Robert Blee, president of the ICAB, says there are many accounting jobs in the insurance industry, and many CAs are employed on the underwriting side. The reason? “Bermuda has a more business-friendly environment than, say, the U.S.,” explains Blee, who is also chief accounting officer of Bermuda-based Ace Ltd., one of the largest insurance companies in the world, with 9,000 staff and operations in 50 countries. About half the Canadian chartered accountants work as audit seniors. After they’ve renewed their initial two-year contract, they either get promoted to manager (and perhaps, eventually, to senior manager) or move on to industry. CAs usually go to Bermuda on twoyear contracts, and love it so much they renew their contracts and stay for as long as they can. They earn good US-dollar salaries that are virtually tax-free, while gaining international business experience and having the time of their lives. Mark Herauf is one of many CAs who moved from public practice to industry. The 34-year-old Edmontonian went to Bermuda as a CA student with Ernst & Young, and after passing the UFE in early 2000, he joined Davison’s of Bermuda, a family-run retail clothing firm, as financial controller. Herauf is one of many CAs who are controllers for small Bermudian companies. However, for all the pluses of sunny Bermuda, there is a downside. Spouses have a hard time finding work. Despite the need for professional workers, the Bermudian government is anxious to keep the beautiful island from becoming overcrowded and maintains strict laws regarding how it allows expatriates into the country, and for how long. Under government regulations, spouses of company– sponsored employees aren’t permitted to take a job that a Bermudian can fill. Julie Herauf, Mark’s wife, has a bookkeeping background but she couldn’t get work. Last summer she returned to Alberta to study to become a pharmacy technician at Red Deer College. Julie plans to rejoin her husband in Bermuda this summer and is optimistic about getting a job in her new field. 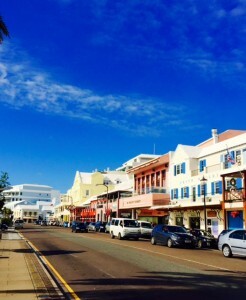 Clearly, the best scenario for a CA considering a stint in Bermuda is one in which his or her spouse is also a CA or in financial services, nursing or IT – all of which are in high demand on the island. Not desirable is a background in the retail or hospitality industries, since there are plenty of Bermudians to fill such positions. To illustrate his point, he tells the story of a Canadian CFO who came to Bermuda with his wife and two young children (it’s worth noting that only two kids per expatriate family are allowed to live in Bermuda, and that private school fees range from US$6,000 to US$8,000 per year). “The family didn’t come for a visit first, they just moved right down and didn’t know what to expect,” Diab recalls. “A couple of weeks after they arrived, the CFO went home from work one day to find a note from his wife that said, ‘I’ve taken the kids and gone back to Canada. I saw a cockroach.’ The CFO followed.” Diab acknowledges this is an extreme example, but his point is if both partners don’t enjoy their experience in Bermuda, then no one wins, including the sponsoring employer. Given that Bermuda is an expensive place, the large accounting firms provide detailed cost-of-living information for incoming CAs so they know exactly what they’re getting into. KPMG, for one, regularly updates its excellent guides for arrivals, which include photocopies of restaurant menus and grocery store ads from the local newspaper. The Robin Hood pub and restaurant, for example, offers large pizzas for about US$20, burger and fries for US$7.50. The more upscale Ascots features appetizers from US$11 to US$14 and main courses from US$19 to US$30. A typical bottle of house wine is US$25. Groceries can run from US$3.29 for a tray of six apples to US$3.30 for a loaf of bread and US$3.55 for two litres of milk. As for transportation, most CAs new to the island buy a moped or motor bike rather than a car. “You can get around faster on a bike here anyway,” says Evan Schemenauer, a 25-year-old from Lake Lenore, Saskatchewan, who came to Bermuda in October 2000 with Ernst & Young and is now with Consolidated Group of Cos. Bikers can slip past cars in “traffic jams” (which, at peak times, last about 15 minutes), and there’s plenty of free parking for bikes, which is not the case for cars. A motorized bike costs approximately US$3,000, plus US$312 in licence fees and insurance. For cars, you’re looking at a minimum of US$13,000 (in addition to almost US$1,000 in fees and insurance). And often tenants are unable to park cars at their homes. The high cost of living in Bermuda is partly due to its income tax free status, which means heavy duties are placed on anything imported, including much of what you yourself bring in with you. But everything is relative: audit seniors at one of the big firms can expect to earn a base salary of US$50,000 plus bonus or overtime (minus small deductions for the company health plan, payroll tax and social insurance). If they’re promoted to a manager’s position, audit seniors will earn between US$60,000 and US$70,000. Those working in industry typically start at US$60,000. Dale Arnburg, who originally went to Bermuda with Grant Thornton, is an avid scuba diver. The reefs surrounding Bermuda have sunk many a ship over the centuries, making it an ideal place for wreck diving. At one point Arnburg moved back home to Nova Scotia, but after the experience of diving in the cold Atlantic waters, returned to Bermuda. “On Christmas Day, 300 of us do a ‘polar’ dip at Elbow Beach – the water is 65 deg F,” laughs Arnburg, a fund administrator with Meridien Corporate Services Ltd. Indeed, not only is the crime rate very low, but Bermuda is the kind of place where strangers say good morning to each other on the streets, and where the most formal office wear for men consists of Bermuda shorts and a blazer, except from about January to March, when the average daily high is the mid-teens Celsius – cool enough that a warmer jacket is welcome for the moped ride to work. In summer, it gets hot and humid, while spring and fall suit most Canadians just fine. “You do get ‘rock fever’ a couple of times a year,” warns Peter Diab. “But I found that’s easily solved with a quick get– away to New York or Miami.” Most east coast US cities are no more than a two– hour flight away, and Toronto is two-and– a-half hours away. Another irritant to those who have just arrived is the lack of selection of products. But, says Chad Critchley, the advantage of a tax-free environment is that “at least you get to choose how you’ll spend your money.” And then there are the inch-long flying cockroaches, which are a reality in a subtropical climate – but so are the flowering shrubs in evidence everywhere. No poisonous snakes or spiders inhabit the island. Anyone who gets to see these “washouts” in action understands the humility of a statement such as that. At a recent tournament at Bermuda’s Admiralty House recreation area, the players – all but three or four of whom are Canadian, and at least half of whom are accountants – go hard after the ball in the subtropical heat. Guys with names of NHL players like “Hossa,” “Damphousse” and “Gill” on their shirts fight for the ball at the boards (actually a five cinderblock high wall) for the ball. In one game, “Bull” plays on despite a bleeding gash on his left shin and a badly scraped right knee. The Bermuda Sharks score one on the Puckheads and a cheer goes up from the sidelines. Ball hockey has existed in Bermuda since the early ’80s, when military servicemen from Canada and the US played at their bases. And the tradition has carried on. “There’s definitely been growth even in the three years since I’ve been in Bermuda,” says BBHA spokesperson Tom Murray, an advertising account manager with a Bermuda newspaper. The loosely organized association now has about 50 members, and since Murray arrived from Halifax with his CA wife, the number of games has increased from one per week to three. “The sport has just exploded here, and we have been getting invited regularly to international tournaments,” adds Murray.